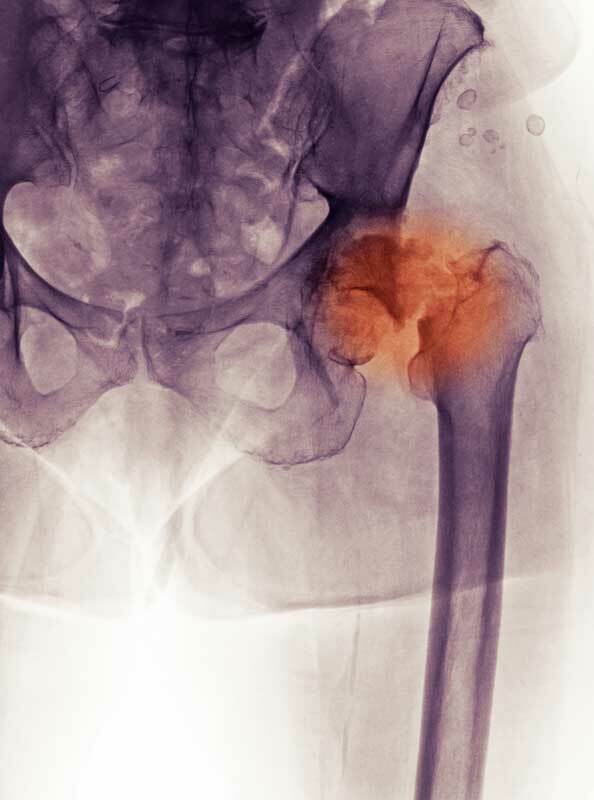 How Do You Know If You Have a Hip Fracture? Most hip fractures are caused by falls, but there are other causes and plenty of ways to prevent them. Other than medications to relieve pain, surgery is usually the only treatment recommended for a hip fracture, unless another pressing medical condition would delay or prohibit it. The formula to determine the probability of a hip fracture is as simple as it is accurate: Age + weakened bones + a fall = hip fracture. And 75 percent of falls are experienced by women. Ninety-five percent of hip fractures are caused by falls (usually sideways, says the Centers for Disease Control and Prevention), and one out of four people over the age of 65 experience at least one fall each year. Less than half of them tell their doctor. A blow to the hip can also cause a fracture, as can (in people with already weak bones) simply standing on the affected leg and twisting. Unless something is done about it, there is a natural loss of bone density and muscle mass as we age. Medications like cortisone, which is used to relieve hip pain and reduce inflammation, can weaken bones if taken for extended periods of time. So can a chronically overactive thyroid. The Mayo Clinic says that calcium and vitamin D deficiencies at younger ages increase the risk of hip fractures later in life. People at risk for hip fractures may have a current vitamin D deficiency, lower body weakness, difficulties with balance or walking, vision problems, foot pain or poor footwear, a history of taking sedatives, tranquilizers, or antidepressants, and hazards at home that can cause falls. If you have hip pain but have not fallen, there is a high probability (95 percent) that something else is causing the discomfort. Even when that is the case, it’s important to see a doctor immediately to get an accurate diagnosis. If your hip is broken, surgery within 24 hours of admission or less might be recommended. A study at McMaster University in Montreal found that the speed of surgery following diagnosis of a hip fracture had a significant impact on outcomes among patients 45 and older (Canadian Medical Association Journal). Almost half of patients who had standard care of surgery 24 hours or more after diagnosis had major complications. Only thirty percent of patients who had surgery within six-and-a-half hours had a major complication. The type of surgery depends on age, severity of the fracture, level of mobility before surgery, and underlying health conditions. In about half of cases, says Britain’s National Health Service, a partial or total hip replacement is performed. A partial hip replacement removes and replaces the ball of the hip joint. It does not replace the socket. In total hip replacement, both are removed, either by traditional or minimally invasive procedures. In other cases, internal repair of the hip is possible with screws, plates, or rods. Prevention of hip fractures begins with prevention of falls. At least one-third among older adults involve hazards at home. Two-thirds of those who fall will fall again within six months, but as many as one-third of all falls are preventable. Below are some things you can do. Ask your health care provider for a fall risk assessment. Review medications regarding side effects that increase the risk of falling. Schedule annual screenings for vision and hearing. Remove tripping hazards, increase lighting, and add rails on stairs and grab bars in the bathroom. Don’t walk around the house in socks (because they slip). Stand up slowly to prevent a blood pressure drop that can make you unsteady. If you are over the age of 50, include 1,200 mg daily of calcium and 600 international units of vitamin D in your diet. Stop smoking and limit the use of alcohol. Enroll in an exercise program that improves balance, fitness, and strength. Tai chi is an example. Regardless of age, gender, and bone health, falls are not inevitable. There are ways to lower your risk of falling and breaking a hip, but each person has to take the initiative. The way to increase your risk is to do nothing. add, aging, alcohol, antidepressants, blood pressure, bone, bone density, bone health, broken hip, calcium, diet, exercise, exercise program, fitness, foot pain, health, hearing, hip bursitis, hip fracture, hip fracture symptoms, hip joint, hip pain, hip replacement, hip replacement precautions, inflammation, mobility, muscle, muscle mass, osteoporosis, osteoporosis in men, pain, partial hip replacement, reduce inflammation, relieve pain, severe pain, side effects, smoking, strength, the aging process, thyroid, total hip replacement, vision problems, vitamin, vitamin d, vitamin d deficiency, weak bones. My mother-in-law aged 83 was suffering from osteoporosis for several years and was under treatment but no cure. She have broken my neck once and back 5 times and also experienced constant pain in her shoulders, back and limbs. A friend introduced me to Best Health Herbal Centre, she told me Best Health Herbal Centre osteoporosis herbal remedy reversed her mother’s osteoporosis within 5 weeks, Now she is osteoporosis free. January this year i purchased osteoporosis herbal remedy for my mother-in-law, she only used it for 5 weeks, her osteoporosis was totally reversed. All thanks to Best health Herbal Centre for saving my mother-in-law life. visit their website for more information ww w .besthealthherbalcentre. com. I thought you might be interested in this article on https://universityhealthnews.com: How Do You Know If You Have a Hip Fracture?